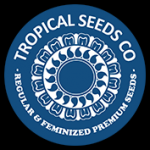 Tropical Seeds - Afrokush Feminised Seeds. Free US delivery. Afrokush is a perfectly balanced indica/sativa strain that combines the genetics of Tropical Seeds' two best mother plants together with a male PCK (Pakistan Chitral Kush). One of the Swazis is fast-growing and early-maturing for a sativa; a compact plant with a marked lemon scent and a good resin producer to boot. The other is rather more bushy, good for both topping and bending to produce a plethora of colas. The buds of this second Swazi are lighter, airier and form fox-tail structures and sporting red and purple colours. Both of these expressions are realised in the offspring of this hybrid strain. Flowering takes around 75 - 80 days with yields varying between medium to high depending on a number of factors including the skill and experience of the grower and environmental conditions. The complex aromas are sweet and floral in nature; Afrokush is a perfect day-time smoke as it won't prevent work getting done and has quite a creative effect, even multi-tasking is possible.